← Fall Juried Exhibition Deadline extended! Don’t forget to register for the 2015 Ghost Ranch Workshop! Space is limited to 14 participants for Darla Bostick’s 8th Annual Ghost Ranch Workshop/Retreat 2015 in Abiquiu, New Mexico. From October 4 – 10, artists are invited to bring materials they already love working with, or maybe some for a technique in unchartered territory. 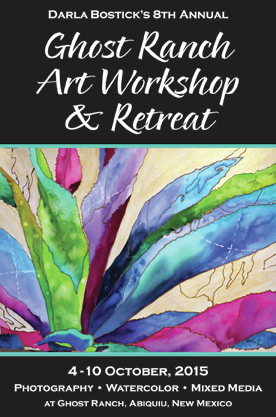 The Workshop includes digital photography, watercolors/acrylics, pencil, text incorporation, mixed media work with an opportunity for plain air painting and a floor-to-ceiling vista view activity room. Lodging and meals are included in the 7 day/6 night fee of $495/ participant. Visit the Georgia O’Keefe studio and home on a tour of the landscape where participants can see the magnificent scenery from where the artist painted. Find out all the details on the Darla Bostick Ghost Ranch Workshop Page.